It is with a great pleasure that we would like to announce, finally, the launch of ILIE NASTASE Retro’73, limited edition. Fond of Ilie and his “bad boy” aura, the Montegrappa new collection of writing instruments wishes to celebrate, as always, the concepts of championship, excellence and peculiar originality with a pinch of humor. The pen collection dedicated to this notorious tennis player from the 1970s is a limited release of 780 piston-fed fountain pens as the total number of his single match victories and 479 rollerball pens that equals the number of his double match triumphs. Exquisitely crafted in Black resin with a Sterling Silver trim, the Ilie Nastase writing instruments draw inspiration from vintage tennis rackets. The pen barrels are made in lacquered wood and feature the Champion’s signature, which is engraved and filled in with red enamel. The forefront nib juncture features a trio of Red, Yellow and Blue resin colours, reminiscent of the wrist band Ilie loved to wear during his play, and which inevitably declared with pride his Romanian origins. 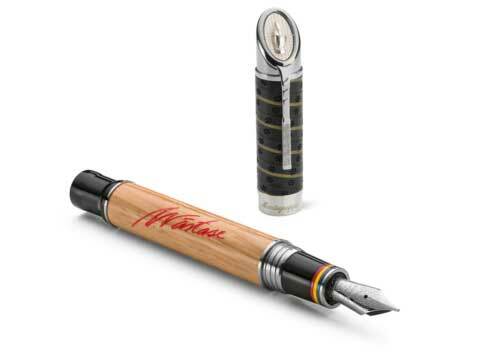 This limited edition collection reaches its utmost of manufacturing perfection when one examines the cap of the pen! A facsimile of a true tennis racket handle is being miraculously crafted with a perforated and printed genuine leather band, the signature clip reiterates the racket shape, and the whole of it culminates into a Sterling silver –cast cap crown, making jokes about Nastase’s hot temper and deeds. The fountain pen from this Icons series collection, is made in 18k gold and will be available in the following writing grades : Extra Fine, Fine, Medium, Oblique Medium, Broad, Oblique Broad, Double Broad and Stub 1.1.